Jonathan Ely Berry, Kyle Rappe, Sean Scriber, Kristen Page-Kirby, Briana Kealaonapuao’ainahau Crakes and Taylor Hines. Photo courtesy of Port Tobacco Theatre. In the best of circumstances, this is a demanding, difficult musical; and the circumstances at the Port Tobacco Players Theatre were quite good. The troupe were up to the challenge and did not flinch from the messy, hateful, heartbreaking and irritating parts of this family. The Port Tobacco cast nails the emotional and psychological grittiness. “Next to Normal” won the 2010 Pulitzer Prize for Drama, becoming the eighth musical to do so. It is a 2008 American rock musical with book and lyrics by Brian Yorkey and music by Tom Kitt. The story centers on a mother who struggles with worsening bipolar disorder and the effects that her illness and its management have had on her family. The musical also addresses grief, suicide, drug abuse, ethics in modern psychiatry. It is one of the rare shows that gives equal weight to the impact on the family. 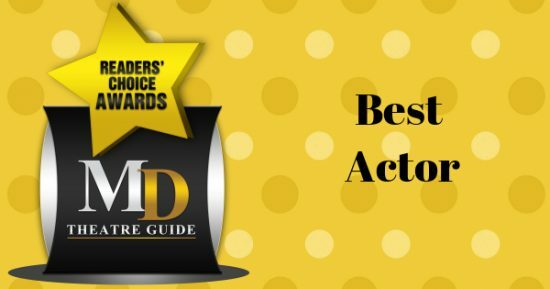 The musical has an Off-Broadway debut, winning the Outer Critics Circle Award for Outstanding New Score and receiving Drama Desk Awards nominations for Outstanding Actress and Outstanding Score. After an Off-Broadway run, the show played at DC’s Arena Stage from November 2008 to January 2009. From there it went to Broadway and was nominated for eleven 2009 Tony Awards and won three: Best Original Score, Best Orchestration and Best Performance by a Leading Actress in a Musical. This show demands a digging down and confidence to tackle some unpalatable truths—not everyone can be saved, and sometimes the people we love the most are the ones that can help the least. The Port Tobacco cast nails the emotional and psychological grittiness. The effects on the family aren’t pretty and have led to coping skills that are frayed and wavering; and one of the most corrosive effects is that everybody comes second to Diana, the mother, which is pretty normal in any household where chronic, serious illness is present. Without giving too much of the story away, after 16 years of dealing with it, Diana’s husband, Dan has become totally focused on his wife (to his credit, he loves her deeply); her nearly grown daughter, Natalie, is falling into depression and anger and a powerful hurt at always being overlooked and starts self-medicating with some of her mother’s old drugs; and the dead son Gabriel, who would be almost 18, is snarky and lonely too. Kristen Page-Kirby as Diana is the center of this show; and she does a beautiful job of portraying Diana in various phases of her bi-polar disease. During “Why Stay” in the second act, she brought to full life the guilt and love and resentment she felt toward her husband; because she was so broken and he was so stalwart, it became almost another burden for her. It was an emotional wallop and done quietly through the song and body language. The rest of the very capable cast includes Kyle Rappe as Dan (her husband); Sean Scriber as Gabe (son); Briana Crakes as Natalie (daughter); Taylor Scott Hines as Henry (Natalie’s boyfriend); and Jonathan Berry as Dr. Fine and Dr. Madden. The cast did a fine job of capturing the essences of their characters. As Natalie and Henry, Crakes and Scott-Hines were vulnerable and tough in equal measures and oh, so heartbreakingly young. Rappe endowed Dan with such steadfastness and so much love and hope you could see how he could exhaust Diana sometimes. Scriber was spot on as the son Gabe, a young man-ghost on the verge of manhood who needed some closure as much as the rest of the family did. As the two doctors (they were nearly interchangeable in their representation of the psycho-pharmaceutical industry, Berry provided some of the needed comic relief, and did a laugh-out-loud funny impersonation of a rock star psychiatrist. 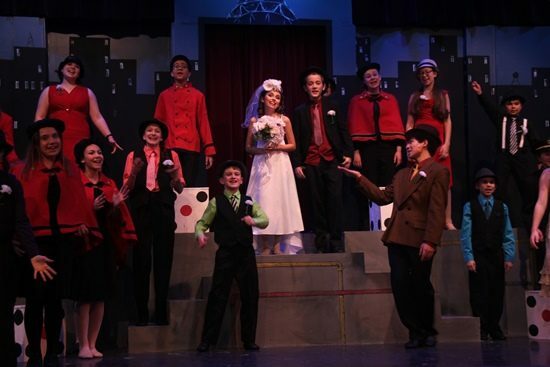 The show was directed by Brooke L. Howells; she directs with a light touch and a good feel for scene changes; they are not intrusive, except the first time Natalie comes in with her keyboard (she was sitting on the bench and sort of pedal-shuffled it onto the stage—it was disconcerting for a moment). The show also benefits from a live orchestra: Ted Michalek on guitar; Rob Weaver on bass; Scott Burton on drums; percussion is handled by Cheri Monk; violin and synethsizer by Rachel Lane; Joan Wolfe Burdette on cello; and James D. Watson is the conductor and keyboard 1. The one caveat I would have is that at times the mikes seemed to dampen the voices slightly; particularly in the lower registers. The set was perfect for this show—it was simple and stark and divided into discrete sections which yet functioned as a whole when needed. The sleek design is the brainchild of Brooke L. Howells and Tessa N. Silvestro. While the most recent edition of the American Psychiatric Association’s Diagnostic and Statistical Manual of Mental Disorders has updated much of its diagnoses, symptoms and treatments since the show was originally conceived, what remains is still remarkable theatre—a pretty frank look at the effects of mental illness on everyone—patient and family/friends alike. This isn’t a story that ends with a happy every after, although there is a modicum of hope, and kudos to Port Tobacco Theatre for taking a chance and delivering an engaging, thought-provoking production. Advisory: Frank discussions of mental illness, drug use, ECT. There is also a page of resources printed in the program. Running Time: Approximately two hours and 10 minutes with one 15-minute intermission. 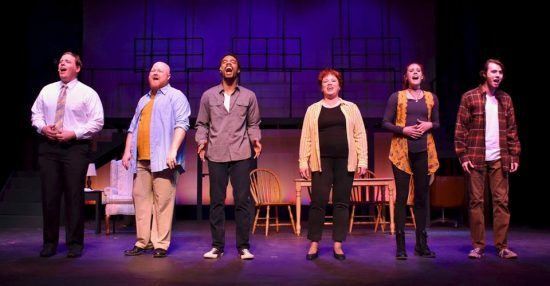 Show Information: “Next to Normal” runs from January 18 – February 3, 2019, at Port Tobacco Players Theatre, 508 Charles Street, La Plata, MD. For more information, please click here. Ms. Johnson has worked in theatre for 10 years as a house manager; and has also volunteered as an usher at numerous theatres in the Washington metropolitan region. She has a long-standing affinity for theatre, going back to seeing the original Man of La Mancha as a child.